Woodrow Wilson is a well-schooled American who served as the President of the US between 1913-1921. He is the 28th President of America who was granted a Ph.D degree in political science. Before he was chosen as a President, he worked as a Professor in many universities. He was also the president of Princeton university. He was the one who recommended that the US should have a parliamentary democracy and has published a few of his political works supporting this form of government in America. His works were later adapted to the academic courses as a course book for students. 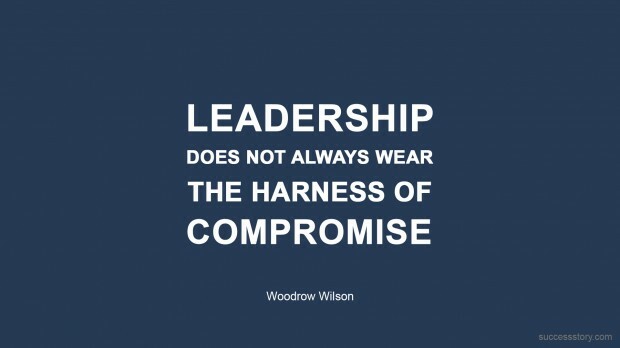 "Leadership does not always wear the harness of compromise." He has said a lot if meaningful things cogent things in beautiful and simple words. We should pray to God for food first. Everything else should find a place after that. Because a hungry man will never be able to make his devotion with an empty stomach. He was courageous enough to say that a strong leader will never make compromises. An effective leader will be strong and try not to make mistakes. Otherwise, power will corrupt power from within. He should make appropriate judgments. Some amount of compromise is accepted. But too much will make you ineffective. According to him, political science is a brilliant way to understand life. A deep study of oneself is the method to perceive the implicit conditions imposed by people surrounding us. These conditions are born out of love which cannot be ignored. There are other meaningful quotes said by Woodrow Wilson which has found a place in people's heart. Here are some of the most valuable quotes of Woodrow Wilson.